Live video, maybe you’ve heard of it. It’s one of the hottest things on the net right now. 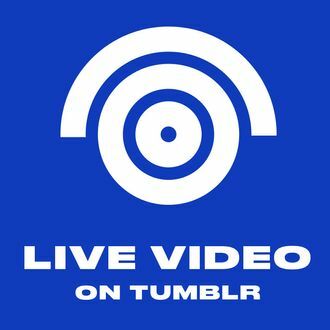 Facebook: “Live video.” Google: “Live YouTube.” Amazon: “Twitch.” Twitter: “Periscope.” Now Tumblr has also decided that live video is another great vector for its user base of deku scrub otherkin and sapiosexual lupine tweens to express itself. There aren’t a whole lot of details, except that the service launches tomorrow and … that’s kinda it. Check out this GIF! Another post on the blog teases a streaming schedule, appearing to coincide with other Tumblr promotional events such as their regular Q&A series Answer Time. These are not, as should be apparent, publishing tools. It’s not clear whether users will also, or eventually, be able to broadcast live. Imagine this question, submitted to a Tumblr user, in the former of a live video though. Who knows what’ll happen? We’ll find out tomorrow.